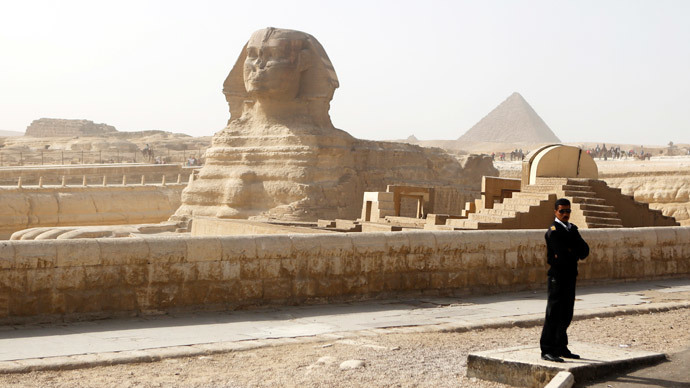 An Islamist preacher from Kuwait has called to destroy Egypt's Sphinx and pyramids, stating it is time for Muslims to erase the pharaohs' heritage. The alleged call comes as Islamic State jihadists ramp up their attacks against historic sites. Although the ancient monuments are not religious – but rather cultural and historic sites – they should still be "destroyed" by Muslims, putting an end to the worship of images, preacher Ibrahim Al Kandari said, according to Al-Watan daily. "The fact that early Muslims who were among prophet Mohammed’s followers did not destroy the pharaohs' monuments upon entering the Egyptian soil, does not mean that we shouldn't do it now," Al Kandari said. Another call for the destruction of Egypt's main symbols comes from Islamic State leader Abu Bakr al-Baghdadi, who suggested the demolition of the historic monuments is a "religious duty," Al Alam news reported on Sunday. In the extreme interpretations of Islam, no material objects should be idolized or worshiped. In 2012, an Egyptian cleric also issued a fatwa calling to rid the country of its pyramids and the Sphinx. The member of the radical Salafi movement said he wanted the antiquities demolished, as Prophet Mohammed destroyed the idols in Mecca, and demanded Egypt's tourism ministry be abolished, comparing the industry to "prostitution and debauchery." The religious ruling was denounced by Egypt's officials and scholars, who claimed the site was part of the country's cultural – not religious – heritage. Attacks on the Sphinx date back centuries. Despite many legends surrounding the monument's missing nose – with harm from Napoleon's cannon being among the most popular myths – historians believe it was actually destroyed by Sufi Muslim Muhammad Sa'im al-Dahr in the 14th century, after he learned that some peasants worshipped the Sphinx.